I was sent a package of Viva Labs Goji Berries to review. 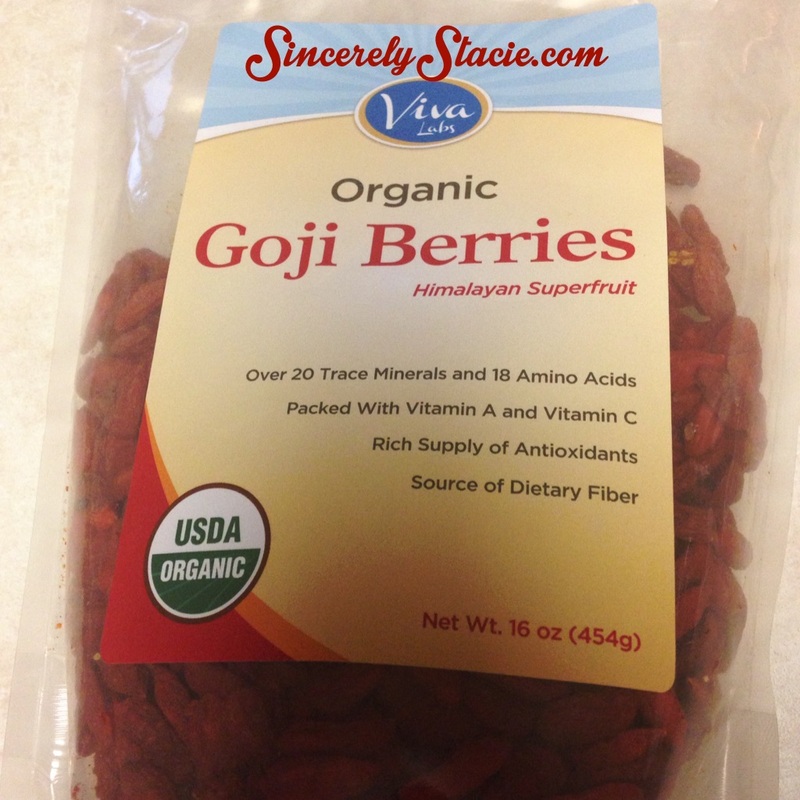 This 2lb package of Goji Berries is full of all kinds of nutrients and health benefits. Goji Berries have been used for ages as part of Chinese medicine. It has also been called the “Longevity Berry”.Goji Berries are known for their healing properties including strengthening the immune system and restoring major organs. They are one of the most nutrient-rich fruits in the world. This little berry includes all kinds of essential amino acids, Vitamin A, Vitamin C, fiber, protein, and antioxidants. Imagine getting all of these nutrients in one tiny little berry! Viva Labs Goji Berries are sourced directly from farmers in accordance with fair trade practices and are certified Organic. 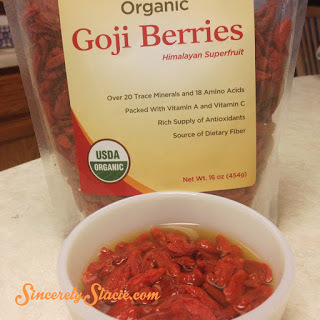 I have used these Goji Berries in various ways including adding them to my regular trail mix, adding them to smoothies, and making Goji Power Snacks. They have a bit of a bitter flavor, but if added to other things it balances out. 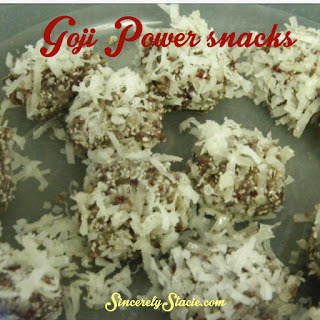 I don’t think I could just eat Goji Berries alone like I would eat raisins. When adding Goji Berries to your smoothies, I recommend soaking them in water first. Just add enough water to cover the berries and let them sit for 10 minutes or so. Then add the berries along with the water to your smoothie. I also like making these Goji Power Snacks to eat on the go or when I need a pick me up! food processor, add the sesame seeds, chia seeds, and pumpkin seeds. Process until chopped fine. Then add coconut oil, dates, and goji berries. Process until blended into a paste. into 12 balls and then roll into the coconut. Keep them in the fridge. Also, the goji berries can be soaked in warm water to soften before processing, just drain the berries before adding them to the food processor. 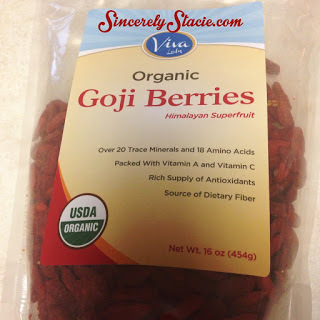 Thanks to Viva Labs for sending the Goji Berries to me for the purpose of this review. This review is my honest opinion. I was not compensated in any way for this review. If you choose to purchase the product through the above link, I may receive a small commission without you having to pay a cent more for your purchase. Thanks for supporting SincerelyStacie.com reviews.